An immune response can usually be described generally as "The reaction of the host's immune system to antigen in an invading (infecting) pathogenic organism, or to foreign protein, as in transplanted organs or tissues. The response is humoral and local; antibod[ies] produced by B cells combine... with antigen in an antigen-antibody complex to inactivate or neutralize antigen. This defensive mechanism often effectively controls infection." An immune response is divided into 2 parts; innate and adaptive. The innate immune response is "the response by the host that comprises the cells and mechanisms that defend the host from infection by other organisms or is activated by endogenous molecules, in a nonspecific manner." The innate immune response is quick and is the body's initial response to unwanted invaders. It consists of the body's non-specific external and internal defense mechanisms. An example of the body's external defense mechanisms are mucus and skin. Skin consists of epithelial and endothelial cells which acts a sort of barrier against infection, invading antigens would have to pass through the initial skin barrier in order to actually get inside the host. Mucous acts similarly to skin, in that it is a barrier of sorts. Mucus traps invading pathogens and sometimes degrades them, preventing them from going any further into the body. Non-specific internal defense mechanisms are put in place in case the invading pathogens gets past the external defenses and actually makes it inside the body. Things such as phagocytes, and Natural Killer (NK) cells attack the pathogen and destroys it before further infection takes place. The adaptive immune response is the body's second line of defense. "Adaptive immunity has evolved to provide a broader and more finely tuned repertoire of recognition for both self- and nonself-antigens. Adaptive immunity involves a tightly regulated interplay between antigen-presenting cells and T and B lymphocytes, which facilitate pathogen-specific immunologic effector pathways, generation of immunologic memory, and regulation of host immune homeostasis." The cells of the adaptive immune system are extremely specific, because during early developmental stages the B and T cells develop antigen receptors that are specific to only certain antigens. This is extremely important for B and T-cell activation. B and T cells are extremely dangerous cells, if they are able to attack without going through a rigorous process of activation, a faulty B or T cell can begin exterminating the host's own healthy cells. Every B and T-cell is different, making way for a diverse community of cells ready to recognize and attack a full range of invaders. This response is much slower than the body's innate response because its cells are so specific and require to be activated before it is able actually act. "In addition to specificity, another principal feature of adaptive immunity is the generation of immunologic memory. During the first encounter with an antigen (pathogen), sets of long-lived memory T and B cells are established. In subsequent encounters with the same pathogen, the memory cells are quickly activated to yield a more rapid and robust protective response". This feature of the adaptive immune response is responsible for the development of vaccines as well as other modern day medicines targeted at disease prevention. Immunologic memory is the basic concept behind the modern day flu shot. The flu shot basically is giving the recipient a dormant flu virus. This activates the recipient's immune response. After the immune response, immunologic memory is activated, so if the individual ever comes into contact with the flu virus again the body will be prepared to deal with it accordingly, this time faster, and more efficiently. 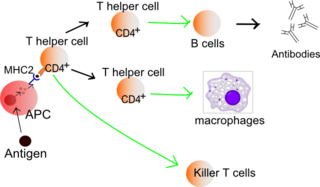 Natural killer cells, or NK cells, are a type of cytotoxic lymphocyte critical to the innate immune system. The role NK cells play is analogous to that of cytotoxic T cells in the vertebrate adaptive immune response. NK cells provide rapid responses to virus-infected cells, acting at around 3 days after infection, and respond to tumor formation. Typically, immune cells detect major histocompatibility complex (MHC) presented on infected cell surfaces, triggering cytokine release, causing lysis or apoptosis. NK cells are unique, however, as they have the ability to recognize stressed cells in the absence of antibodies and MHC, allowing for a much faster immune reaction. They were named "natural killers" because of the initial notion that they do not require activation to kill cells that are missing "self" markers of MHC class 1. This role is especially important because harmful cells that are missing MHC I markers cannot be detected and destroyed by other immune cells, such as T lymphocyte cells. Humoral immunity or humoural immunity is the aspect of immunity that is mediated by macromolecules found in extracellular fluids such as secreted antibodies, complement proteins, and certain antimicrobial peptides. Humoral immunity is so named because it involves substances found in the humors, or body fluids. It contrasts with cell-mediated immunity. Its aspects involving antibodies are often called antibody-mediated immunity. Cell-mediated immunity is an immune response that does not involve antibodies, but rather involves the activation of phagocytes, antigen-specific cytotoxic T-lymphocytes, and the release of various cytokines in response to an antigen. Historically, the immune system was separated into two branches: humoral immunity, for which the protective function of immunization could be found in the humor and cellular immunity, for which the protective function of immunization was associated with cells. CD4 cells or helper T cells provide protection against different pathogens. Naive T cells, mature T cells that have yet to encounter an antigen, are converted into activated effector T cells after encountering antigen-presenting cells (APCs). These APCs, such as macrophages, dendritic cells, and B cells in some circumstances, load antigenic peptides onto the MHC of the cell, in turn presenting the peptide to receptors on T cells. The most important of these APCs are highly specialized dendritic cells; conceivably operating solely to ingest and present antigens. Alloimmunity is an immune response to nonself antigens from members of the same species, which are called alloantigens or isoantigens. 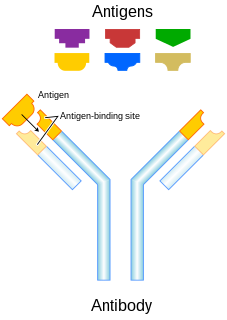 Two major types of alloantigens are blood group antigens and histocompatibility antigens. In alloimmunity, the body creates antibodies against the alloantigens, attacking transfused blood, allotransplanted tissue, and even the fetus in some cases. Alloimmune (isoimmune) response results in graft rejection, which is manifested as deterioration or complete loss of graft function. In contrast, autoimmunity is an immune response to the self's own antigens. Alloimmunization (isoimmunization) is the process of becoming alloimmune, that is, developing the relevant antibodies for the first time. A breakthrough infection is a case of illness in which a vaccinated individual becomes sick from the same illness that the vaccine is meant to prevent. Simply, they occur when vaccines fail to provide immunity against the pathogen they are designed to target. Breakthrough infections have been identified in individuals immunized against a variety of different diseases including Mumps, Varicella, and Influenza. The character of breakthrough infections is dependent on the virus itself. Often, the infection in the vaccinated individual results in milder symptoms and is of a shorter duration than if the infection was contracted naturally. Polyclonal B cell response is a natural mode of immune response exhibited by the adaptive immune system of mammals. It ensures that a single antigen is recognized and attacked through its overlapping parts, called epitopes, by multiple clones of B cell. In immunology, an adjuvant is a substance that potentiates and/or modulates the immune responses to an antigen to improve them. The word "adjuvant" comes from the Latin word adiuvare, meaning to help or aid. "An immunologic adjuvant is defined as any substance that acts to accelerate, prolong, or enhance antigen-specific immune responses when used in combination with specific vaccine antigens." An experiment in immunology is a method of investigating immunological responses to antigens, or detecting and characterizing antibodies and lymphocytes. Findings from these experiments can be used to manipulate the immune system and develop drugs to combat immunological diseases. Natural killer T (NKT) cells are a heterogeneous group of T cells that share properties of both T cells and natural killer cells. Many of these cells recognize the non-polymorphic CD1d molecule, an antigen-presenting molecule that binds self and foreign lipids and glycolipids. They constitute only approximately 0.1% of all peripheral blood T cells. Natural killer T cells should not be confused with natural killer cells. The Danger model is a theory of how the immune system works. It is based on the idea that the immune system does not distinguish between self and non-self, but rather between things that might cause damage and things that will not. Immunological memory is the ability of the immune system to quickly and specifically recognize an antigen that the body has previously encountered and initiate a corresponding immune response. Generally these are secondary, tertiary and other subsequent immune responses to the same antigen. Immunological memory is responsible for the adaptive component of the immune system, special T and B cells — the so-called memory T and B cells. Immunological memory is the basis of vaccination. ↑ King RC, Stransfield WD (1998). Dictionary of genetics. New York, Oxford: Oxford University Press. ISBN 978-0-19-50944-1-1. 1 2 Hadžiselimović R, Pojskić N (2005). Uvod u humanu imunogenetiku / Introduction to Human Immunogenetics. Sarajevo: INGEB. ISBN 978-9958-9344-3-8. ↑ Lawrence E, ed. (1999). Henderson's Dictionary of Biological Terms. London: Longman. ISBN 978-0-582-22708-8. ↑ Porta MS, Last JM (2018). A Dictionary of Public Health (2nd ed.). Oxford University Press. p. 236. ISBN 978-0-19-184438-6. ↑ Vincent J, Hall JB, eds. (2012). Encyclopedia of Intensive Care Medicine. Berlin, Heidelberg: Springer Berlin Heidelberg. doi:10.1007/978-3-642-00418-6. ISBN 978-3-642-00417-9. 1 2 3 Bonilla FA, Oettgen HC (February 2010). "Adaptive immunity". The Journal of Allergy and Clinical Immunology. 125 (2 Suppl 2): S33–40. doi:10.1016/j.jaci.2009.09.017. PMID 20061006. ↑ "Britannica Academic". academic.eb.com. Retrieved 2018-12-03. Wikimedia Commons has media related to Immune response .